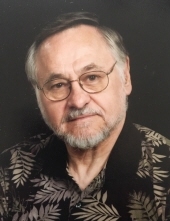 Edward “Ed” “Mooney” R. Kovacevich, age 83 of Plainfield, IL formerly of Glen Ellyn, IL at rest Tuesday, January 22, 2019 at his home. Born February 3, 1935 to his loving late parents, Matthew and Nepomucene Kovacevich. Beloved husband of the late Genevieve “Jeni” Kovacevich, for 49 years. Loving father of Kathryn (Barry) Woodrow and Karen (Brian) Wegner. Cherished grandfather of Matthew, Mary, Jonathan, Jacob, Olivia and Lukas. Preceded in death by siblings, John, Frank, Jim, Matt, Mary, Ann, George, and Joe. Devoted man to his children and grandchildren and Ice Cream! In lieu of flowers, memorials may be directed to Kindred Hospice, 800 Enterprise Drive, Suite 111, Oak Brook, IL 60523. Visitation: Friday, January 25th 4:00-8:00 PM at Overman-Jones Funeral Home & Cremation Services, 15219 S. Joliet Rd., (Corner of Rts. 30 & 59), Plainfield, IL 60544. Mass of Christian Burial: Saturday, January 26th 10:30 AM at St. Andrew the Apostle Church, 505 Kingston Drive, Romeoville, IL 60446. To send flowers or a remembrance gift to the family of Edward R. Kovacevich, please visit our Tribute Store. "Email Address" would like to share the life celebration of Edward R. Kovacevich. Click on the "link" to go to share a favorite memory or leave a condolence message for the family.